"I have never been a very frightened person. But there is one thing I am terribly scared of, and that is that I would wake up one day, be 82 years old and realize I didn't live the life I wanted to live." This one of the opening quotes from Monika Petrillo's documentary, Flyabout. At the age of 24, Petrillo decided to follow a lifelong dream and learn to fly. She explains that learning to fly was a way to prove to herself that she was living the life she wanted to live. Soon after, a funny thing happened: her father was so inspired by her actions that he discovered he also had an interest in flying and earned his license that same year. They then decided to take advantage of their new skills and joined a tour group for a self-fly air safari that would circumnavigate Australia. I knew this film would be right up my alley because it combines both my love of flying and also my passion for travel. The quote above resonated so well with me because I had similar thoughts several years ago. It was that fear of living with regrets that drove me to start this blog back in April of 2004 and to finally seek my license, one of the best decisions of my life. For me, this was a wonderful film. It is not nearly as polished as some of the more recent aviation documentaries like One Six Right or the clips we have seen from the in-production film A Pilot's Story. Most of this film was shot from Monika's point of view with her literally holding a hand held camera and often turning the camera onto herself. But it combines aviation, travel and an interesting story of a women who sees herself maturing during this experience. Petrillo spends a lot of time while flying contemplating how her relationship with her family has changed as she grows older. She begins to associate this flying experience, to be similar to an Aboriginal walkabout which is a rite of passage that often takes place during adolesence, hence the name of the film - Flyabout. She experiences many flying and relationship challenges during this trip that she was able to overcome due to her wonderful attitude. She commented that "the difference between an ordeal and an adventure is your attitude", a lovely quote I wrote down as soon as I heard it. I want to thank Dan Pimentel of Av8rdan's World of Flying for his recent review of the film. If you are an aviation enthusiast I am confident you will enjoy this film. 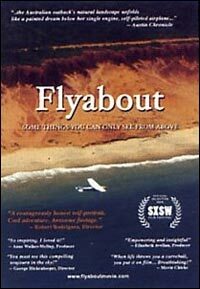 You can purchase it on DVD directly from the Flyabout website. If you are planning on attending AirVenture 2009 be sure to check out one of several screenings scheduled for the week. Monika Petrillo will be on hand to discuss her experiences. I recently learned that after several years of not flying due to becoming a mom, Petrillo has just recently completed a BFR and is looking forward to flying frequently again. Thank you for sharing this movie with me ... I loved it!